If you look carefully in empty lots or along the roads, you can find wild fennel going to seed. These seeds are delicious, especially with roast pork. 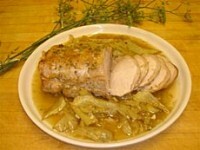 Here is a simple recipe with a very Tuscan taste which can be made with wild fennel seeds or storebought ones ground up in a mortar and pestle with salt and rubbed all over a pork loin roast. 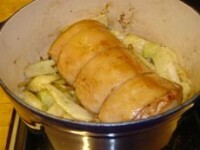 Browning it in a heavy pan and then cooking it covered is a method designed to keep the pork tender. 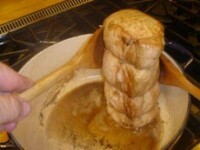 You can also submerge the roast in a brine (1/2 cup coarse salt mixed with 1 gal. cold water) for 1 to 4 hours before browning. The best is to slice the leftover roast thinly and make into sandwiches, as they do in Tuscany! To roast the pork, tie it with strings at one inch intervals so that it will keep its shape when cooking. Brown it on all sides in a layer of butter and olive oil, including the ends. Remove from the pan. Into the oil, stir the fennel with a generous sprinkling of salt, and cook over high heat until the fennel is slightly colored. 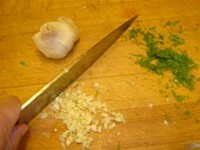 Stir in the garlic, the fennel fronds, the fennel seeds, and the chicken stock. Return the pork to the pan, cover and place in a 350 oven. Cook for about 45 minutes, or until the meat is 140 degrees when tested with an instant reading thermometer. Remove from the oven and let rest for 10 minutes before carving. Carve into serving slices. 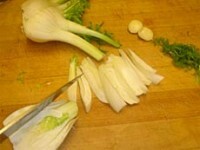 Taste the fennel, stir in additional butter or olive oil and season to taste with salt and pepper. 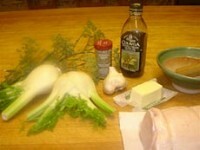 Surround the meat with the cooked fennel.